With Thanksgiving approaching, it’s time to plan for festive cocktailing! Mrs. Bitters has already started prepping our locavore Thanksgiving (there’s a story behind it being locavore, but you’ll have to wait for it), so now’s the time for me to plan my approach. I haven’t quite figured it all out yet. I know I want to get some Calvados and make a batch of sage simple syrup, so that I can mix up the Apple Sage Old Fashioned I created for the autumn issue of Edible Rhody (still on the stands, so if you’re local, grab a copy–it’s the one with the cranberry bog on front). Stir over ice and strain into a chilled cocktail glass. Add garnish. As gaz discusses in his piece, scotch marries well with anise flavors, and we definitely found that to be the case here. Earlier this year, I picked up a bunch of anise hyssop from a local herbalist. Back then, I used it in a variation of the New Orleans classic cocktail, the Vieux Carre. On Saturday, when we were at the market, we stopped by the Farmacy table to pick up some local honey for Thanksgiving baking. They happened to have as well some small jars of honey infused with the anise hyssop. I immediately started thinking about cocktail applications and eagerly bought a jar. I might do a variation on the Babbling Brook. Or, I might do a scotch Sazerac instead, with a syrup made from the hyssop honey. I don’t think I’ll go wrong either way. How about you? What Thanksgiving-themed drinks are you planning to mix this year? Do you have special Thanksgiving snacks that pair well with cocktails? Sound off in the comments! Still in VF’s 1/35 issue. Click through to Flickr to enlarge. Last week, I was catching up on my RSS feeds, when I saw a post by Helmut Adam, of the German magazine Mixology, about a series of viral ads the Bacardi company is running. The series begins with an ad called “The Samurai” (running time: 1m:59s). A man enters a Japanese bar, while a voiceover tells us, “There’s only one bartender in the world that I’d have mix me this drink. He’s so in tune with his surroundings, he knows your drink before you do.” The man approaches the bartender, who bows slightly and says only, “Daiquiri?” The man nods. Look at those beautiful bar tools! The beaker-shaped mixing glass, the tall jigger, the spoon with the fork at the end. Lovely. (And by the way, you can buy this stuff at my friend Greg Boehm’s website, Cocktail Kingdom.) Watch how gracefully but precisely he mixes the drink. Lovely. That’s just the kind of bartender I could watch all day. And yet, he’s an actor, trained by bartender Marian Beke of London. To give it a bit of context, they aren’t ads but pieces of film content aimed at and created for the world’s top bartenders. It’s about celebrating the unique skills that each bartender at the top of the game possess. Video 3, “The Apothecary” (2:12) is set in a bar similar to PDT or Milk and Honey. As the camera pans the room, you see a shelf of vintage cocktail manuals. (I saw an old copy of the Savoy and the Esquire Handbook for Hosts, but I can’t place the rest. And one of the volumes isn’t even a cocktail manual, so I assume there’s other “filler” there.) Then you see jars of spices before the camera settles on a bartender grinding spices with a mortar and pestle. The man asks the bartender to surprise him, at which point the bartender brings out trays of fresh herbs. As he works, you see flashbacks of the bartender smelling herbs, tasting tinctures, and taking notes. He pulls down a jar of eucalyptus-infused sugar and then muddles it with mint and lemon verbena. Then ice, rum, and a splash of soda. It’s only in this final video that you clearly see the Bacardi marque and logo. In the first two, you can make out that the bartenders are pouring from bottles of Bacardi, if you pay attention, and when The Samurai video hit the web, viewers figured out this was some sort of Bacardi viral even before Think Espionage confirmed it. That seems to be the hallmark of a successful campaign: you can figure out the source if you choose to. I think Bacardi and TE have succeeded in two ways here; one, they’re getting people talking about the brand. I don’t even normally like Bacardi, but here I am anyway. And that’s specifically because they chose to highlight good bartending and found a way to convey the skills and talents of good bartenders. When the Hummingbird and Apothecary videos are publicly available, I’ll link out to them. They’re fun to watch. 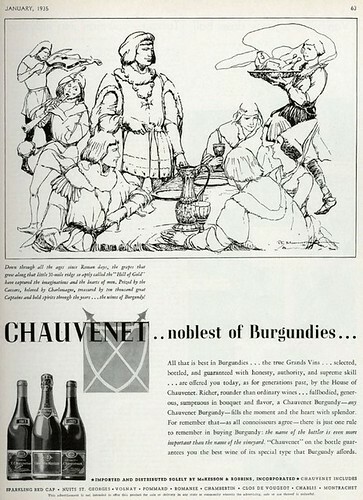 It’s hard to see this here, but what these brands had in common then were their importer, who took out this ad. 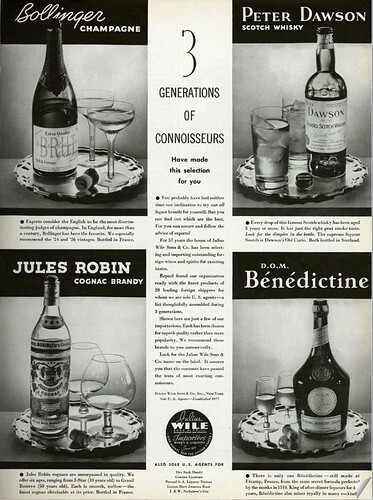 Julius Wile Sons & Company was a renowned name in wine importing. In 1995, the New York Times spoke with Julius Wile–not the one who founded the company, but his grandson who shared his name. You might recall I was nominated for a Foodbuzz award for best cocktail/spirits blog, along with Jay Hepburn from Oh Gosh!, Marleigh and Dan Miller of Sloshed, and Jeffrey Morgenthaler. The winners were announced earlier tonight, and the honor goes to Marleigh and Dan at Sloshed. Congratulations to them, and thanks to everyone who voted, even those of you who traitorously voted against me.